With over 1 billion users on Facebook, this social platform can only be described as the goldmine of advertising. Facebook marketing is taking over the online marketing arena to become one of the top online advertising mediums. Facebook advertising strategy is a vital part of virtually every social media strategy. Facebook advertising offers lots of benefits to a brand though not without its cost. Many businesses, large and small alike are tapping into the power of Facebook marketing for the purpose of promoting their brand message and even getting clients. How Effective is Facebook Advertising? The effectiveness of Facebook advertising can only be determined by the benefits it offers. So I’m going to use the benefits of Facebook advertising for businesses all over the world to answer this question. Facebook offers a potential reach of over one billion people if you have to budget for it. Facebook advertising has proven very effective for reaching a large number of people at the shortest time possible. A small business owner was able to reach over 16,000 people with a Facebook ad budget of less than $100! Facebook offers exposure for you business at the shortest time possible. With an effective Facebook advertising strategy, a new business can go from zero to hero in less than one week. The Facebook advertising platform is very easy to use. Many small business owners who want to cut costs even go the DIY route for Facebook advertising. The cost of Facebook Advertising is one thing that makes it very attractive to marketers and business owners around the world. Facebook advertising cost can be as low as a dollar and as high as any brand can afford. One small business got over 700 likes on a post with a budget of $50; that’s engagement for less! This type of engagement was previously unimaginable during the years we were stuck with traditional marketing. Facebook engagement comes in form of comments, shares, likes, clicks and views. Facebook advertising is very easy to measure. The Facebook advertising platform has been designed in such a way that anyone can measure marketing activities in real time. The benefits of real time measurement are massive including being able to tweak ads that aren’t performing so well. So what has video got to do with Facebook advertising? Lately, one trend has taken over the Facebook advertising niche. This trend has become a core part of any Facebook advertising strategy; this trend is simply the video trend. Video is an engaging and immersive form of media that lets you capture a moment and tell your story in a captivating way. The Facebook video advertising is growing at an exponential rate and reaches an average of 1 billion views each month. Video on Facebook was built to be mobile first, and currently, more than 65% of video views are on mobile. Considering that the Facebook Video trend is just getting started, that’s massive! Currently, business owners are leveraging on Facebook video ads to spread the word about their brand and products. Videos advertising aren’t popular without reason, no. Videos do more than just tell the story of a brand; they take advertising benefits to an all new level. I’ll be reviewing some great reasons why videos are becoming an effective part of any Facebook advertising strategy. One of the reasons videos are undeniably great for any Facebook advertising strategy is the potential for virability. Using the right Facebook marketing tools, a marketer or business owner can create video ads that can be potentially viral. The benefits of online virability for a brand are endless. A small business selling a product can go out of stock as a result of a viral video. It’s no longer news that Google favor the video media. Facebook videos are very easily searchable on Google just like YouTube videos. This has a powerful impact on the SEO of a brand’s Facebook platform and even website. Facebook video advertising is very effective for not just generating views but also for conversion. A brand that creates quality, strategic videos will sure look forward to great conversion on Facebook and other online and even offline platforms. If text based Facebook advertising delivers engagement, Facebook video advertising delivers much more. The visual nature of video generates more engagement on Facebook than text ever could. Videos used for Facebook advertising generate more shares, likes, clicks and views resulting in more brand exposure. With the many benefits Facebook advertising offers, it’s just natural that if offers great results on investment. Many brands that carry out effective video Facebook advertising see as much 300% returns on advertising investments. Videos are a great feature to add to your Facebook advertising strategy. However, any brand that is looking to use videos for Facebook advertising must understand that the right tools must be used together with a great strategy in order to create a video advertising that packs a punch. Are you looking for a way to create effective Facebook advertising for your brand? 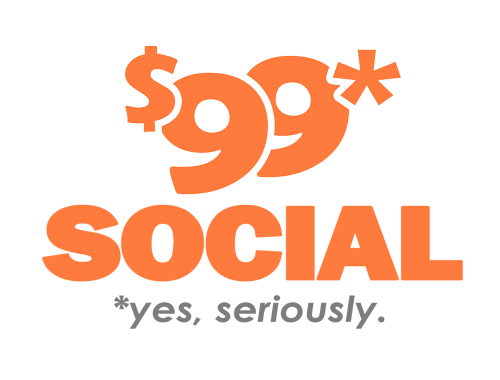 You can get in touch with us at 99DollarSocial to discuss your Facebook advertising needs. We Help Grow Your Business. Sign Up Today!